There have been plenty of obnoxious, unnecessary, and useless action figures released over the years. Faker was simply a He-Man toy painted blue, the meat that Rocky beat up on was not an accessory, but sold as a separate figure, and Star Wars is notorious for marketing characters seen on screen for seconds (or not at all, in the case of Constable Zuvio). The man behind action-figure website Death By Toys may have gone too far, though: He’s created an action figure of the most famous piece of weather committed to the silver screen this side of Kansas, “some fog” from John Carpenter’s The Fog. Honestly, they probably could have simply gone with an empty box (it worked for Lucas in ’77). But rather than sell a box that claims to have a complex atmospheric phenomenon inside, collectors will receive what appears to be fake spider web left over from Target’s Halloween section. “I probably should’ve started by saying this is quite possibly the stupidest thing I’ve ever made,” says Dan Polydoris, the man behind this nonsense. That being said, the Chicagoan has also created some very cool custom action figures that would certainly appeal to thirtysomethings with a bad case of arrested development. He’s done retro-styled sculpts of characters from Mega Man 2, the Teenage Mutant Ninja Turtles reimagined as famous slashers, and a line based on the pixelated heroes featured in Activision hits such as Pitfall! and Pressure Cooker! Polydoris is certainly not delusional. He normally sells his custom figures for $50 a pop, but “some fog” will go for $25. 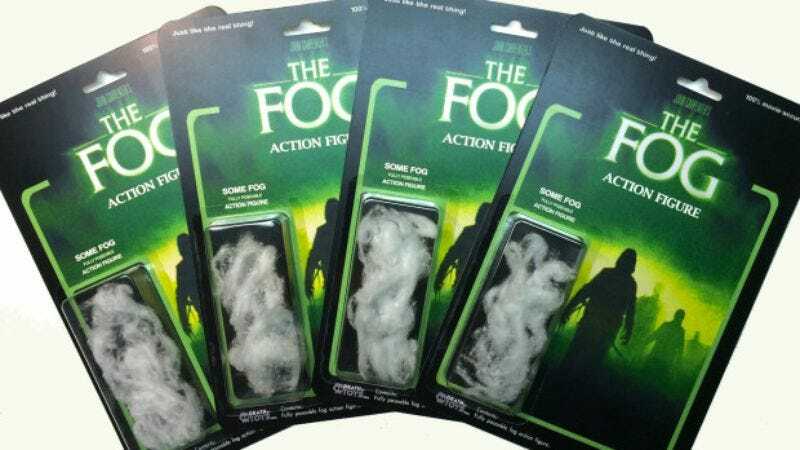 And it may be worth it, if only for the box art: As silly as the concept of a piece of pulled cotton as a toy is, the box art for “some fog” is sharp, as are all of Polydoris’ takes on Kenner-style packaging. Hopefully a 3 ¼” Tom Atkins will be thrilling fans shortly. On an unrelated note, look out for a bag of sand from Hasbro’s third wave of Star Wars: The Force Awakens merchandise.